Middle-earth: Shadow of Mordor is now available on PC and all next-gen consoles. While I can't wait to check this game out for myself to see how well (if at all) the narrative fits into Tolkien's canon, I'm stuck waiting until the game's PS3 release on November 18 (I think I'll prefer console to PC, in this case). In the meantime, I am enjoying the game vicariously through friends' reviews and YouTube videos. 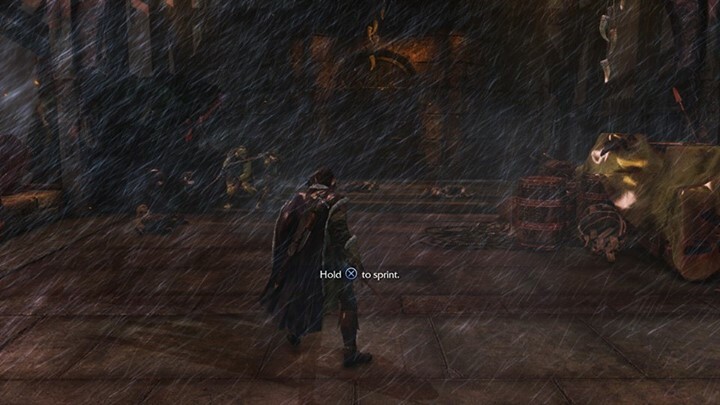 Corey Brooks (@LOTRHobbit93 on Twitter), a friend and fellow gamer/Tolkien fan, was kind enough to allow me to host his review of Middle-earth: Shadow of Mordor here on my blog. One does not simply walk into Mordor. Unless you're the Gondorian ranger Talion. Then it's as easy as Legolas taking down orcs in Mirkwood. Middle-earth: Shadow Of Mordor is the Middle-earth game many have been waiting for. While Middle-earth in the format of video games has had a rich history (ranging from great to not-so-great outings), none but The Lord Of The Rings Online have truly been amazing and fun games to play for hours on end while vividly bringing J.R.R. Tolkien's world to life. And while I've enjoyed every Middle-earth game that's been released, some have been waiting for a truly great virtual experience set in this world. Shadow Of Mordor has changed this, and definitely set the bar pretty high for future outings of Middle-earth related games. 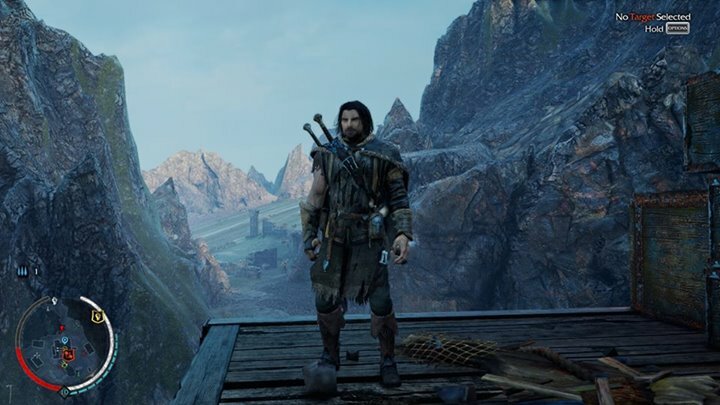 The game follows Talion, a ranger of Gondor who, along with his family, is slain at the Black Gate of Mordor, where he has been stationed to keep watch over the cursed land. Some SPOILERS will follow on the story, so if you haven't played yet or do not want to be spoiled, then look away! Right off the bat the tone, very brutal and sad as Talion one moment spars with his son, then is being beaten bloody by an orc. I've never actually cried playing a video game before, but the moment Talion and his family are killed, and how he tells his son "I'm right here! Look at me! ", really had me balling my eyes out, and matches the emotional scale of Peter Jackson's Middle-earth films. After a heart wrenching opening, Talion is brought back from the dead by a wraith, who after regaining memories of his past, finds out he is Celebrimbor, the greatest smith of the Second Age, and forger of the Rings of Power, and together, they try to find out why this has happened, along the way also avenging the death of Talion's family by the Black Hand, a servant of Sauron. The story is fantastically done, having a nice cinematic feel to it, with brilliant motion capture and voice work by Troy Baker, who portrays Talion. Players will encounter Gollum, and I love the Frodo/Sam relationship that Talion and Celebrimbor have with the gangly creature. Talion also aligns himself with a cowardly orc called Ratbag, who'll do anything to become a warchief, which also will play in Talion's favor amongst the ranks of Sauron's army. Talion and Ratbag's relationship is pure gold, and had me laughing many, many times. 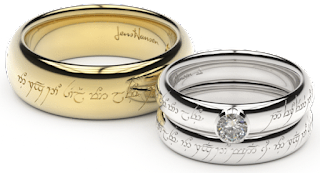 Many Tolkien fans are hesistant on the story, and while some of it does go against Tolkien's lore, it still holds up as a nice mature tale of a man seeking revenge, with some great lore sprinkled throughout. I love seeing new characters, and Talion has definitely become one of my favorite Middle-earth characters, from his warrior prowess to just being a person you sympathize after the tragic opening. The story can be completed in about 20 hours, but many side quests and collecting artifacts will prolong your journey. Overall, a very cinematic story, and one I definitely enjoyed, hope to see more original stories done this way in future Middle-earth games. Where the game really shines through is in its gameplay. I don't think I've played a more addicting game in such a long while. The combat is the smoothest I've seen in any game lately. Combat flows greatly between enemies, and you can easily back out of a current action to counter an oncoming enemy's blow, instead of having to wait for your execution to finish and by then be bludgeoned to death by said foe. Performing executions is a blast, and the finisher animations are brutally delightful, seeing Talion knock an orc down, then beheading him while he tries to get back up. The wraith abilites also add an awesome form of gameplay, ranging from Talion teleporting to a distant enemy, to draining an orc to refill your arrows (and afterwards implode the orc's head). Each of Talion's ranger and wraith abilities can be upgraded, and wepaons can have special runes slotted to regain health or increase the chance of regaining arrows for your bow, to share a few, and adds a nice feature of combining runes to help you in your battles. You can spend hours alone just roaming Mordor looking for orcs and just decimating their ranks. This isn't to say that Talion is unstoppable. You can easily become overwhelmed by the enemy, and be forced to retreat (and be taunted at afterwards), or fight to your last breath like Aragorn and his companions at the Black Gate. Strategy plays an important part in the game. You can take a more brawn approach and rush headlong into an orc stronghold, or you can sneak your way, stealthly killing orcs along the way and setting off traps and fires as you roam through the ruins. I spent almost an hour alone trying to free some captives from orcs for a side quest, and had to think of how to free them or draw them away from the prisoner to cut his bonds. Caragors (think wargs but more cat-like) and Graugs (troll-like behemoths who scarily eat trolls) also add a whole new dimension of fear. When I see caragors coming on the map, my heart stops and fear takes over. They're brutal beasts, and I easily fell to a few of their jaws and claws. And graugs, well, you better high-tail it out of there should you encounter one. The Nemesis System is such a blast to play around with. Easily one of my most favorite gameplay features in any video game. You can spend hours on end just slaying captains or interrogating them to gain intel on other orcs within the Uruk army, and also have some send death threats or even betray his higher-up, and be your eyes and ears within Sauron's army. Many Uruk captains can be a pain to kill, some traveling with a battalion of orcs, requiring a more stealthy approach to defeating him. Each Uruk captain/warchief has strengths and weaknesses that you can use to defeating them, so it pays to gain intel on a Uruk captain you are planning on attacking. There are also many Power Struggle quests strewn throughout Mordor that are very addicting to play, ranging from stopping an orc captain from recruiting more followers, to ruining the feast of a victorious orc by poisoning their grog or downright just slaying him in front of his army. An awesome feature as well is how any orc can become a captain if they manage to kill you. I had a lowly orc soldier rush in and hit me with a spear, and he was promoted to a captain and rose in the ranks until I finally manage to end his tyrannical reign of terror. Middle-earth: Shadow Of Mordor is truly an addicting game where you can easily lose track of time. I've spent a day alone just playing around in the first portion of Mordor, Udun, collecting artifacts and doing side quests helping slaves or completing the endless Power struggles. Slaying orcs has never been so fun, and never once gets repetitive thanks to the amazing executions and constant change-up of how battles can turn out, from taking on two or three orcs, to one raising the alarm and having a whole army on your back and cowardly hiding up in the ruins while they throw spears and weapons and fire crossbows at you. The Nemesis System is truly a great new tool in gaming in general, and even after the story mode will have you spending countless hours moving the "pieces", so to say. A great, cinematic story also lends to the game's amazing experience, with phenomenal motion capture from the characters and truly emotional moments sprinkled throughout. The meaty, hard-hitting, smooth-flowing combat also amps the game up even more, and offers many ways to fight your way through Mordor. My score would definitely have to be an easy 10/10, a truly great adventure that can tide over any Middle-earth fan savoring for more from this tremendous world, and, in my case, ease the wait for the final The Hobbit film, The Battle Of The Five Armies. Have you played Middle-earth: Shadow of Mordor yet? If so, what are your initial thoughts? If not, do you plan on playing it at some point? Let me know! !